Classic Italy is the perfect introduction to Italy, covering the must-see cities of Rome, Florence and Venice plus a relaxing stay at an exclusive retreat in the Tuscan countryside. Over the journey, immerse yourself in Italy’s iconic cultural treasures, indulge in the finest wines of Tuscany’s vineyards and explore the historical ruins of an ancient world. Incorporating access to famous sites, leisure time to satisfy your adventurous spirit, deluxe transport and quality 4 and 5 star hotels, the experience is one to be savoured. Bienvenuto! Welcome to historic Rome, Italy’s capital, the epicentre of the ancient world and the idyllic starting point for your Classic Italy tour. Upon arrival, transfer to your hotel to freshen up before enjoying the day and evening to stroll to the Spanish Steps and Trevi Fountain and absorb the energy of Rome’s nightlife. 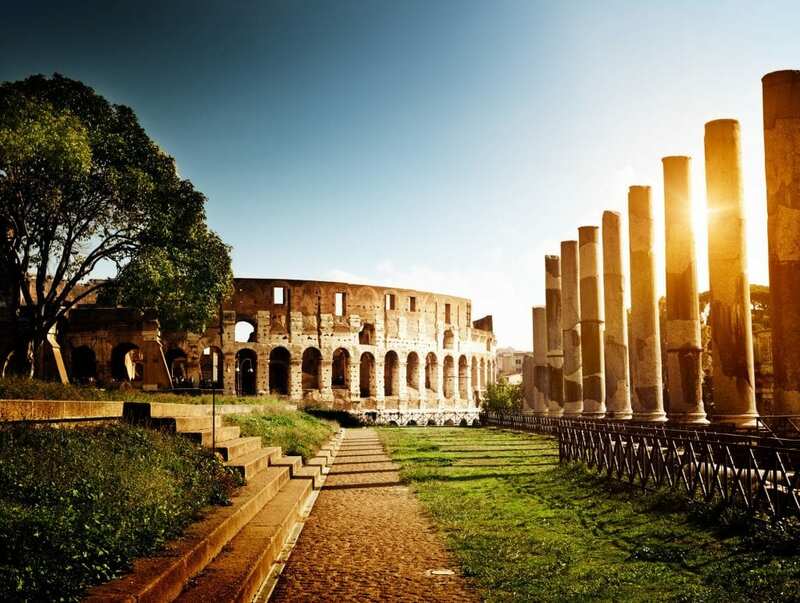 Enjoy a private tour of ancient Rome including the Colosseum, Arch of Constantine, Roman Forum and Palatine Hill. Our guide will meet you in the hotel and you shall explore Rome as a local using public transport. The afternoon is at your leisure. Options include exploring St Peter’s and the Sistine Chapel, strolling the gorgeous canopies of the Villa Borghese gardens or shopping on Via Del Corso. 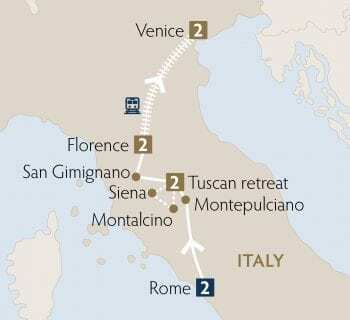 Depart Rome and head north into Tuscany. Visit the charming town of Montepulciano, built on a sloping, narrow limestone ridge with one of the most impressive piazzas in Tuscany. Afterward, indulge in a fantastic lunch paired with wine tasting. Continue to your Tuscan retreat to relax or perhaps partake in an optional Tuscan cooking class to learn the culinary secrets of the region. Visit Siena for a guided morning tour of one of Italy’s most enchanting cities. While Florence saw its greatest flourishing during the Renaissance, Siena’s artistic glories began earlier and are Gothic inspired. The medieval centre bristles with majestic buildings, such as the Palazzo Pubblico, while its plethora of churches and small museums harbour a wealth of artwork. Enjoy time for an independent lunch and stroll before continuing to Montalcino for an afternoon tasting at a renowned winery. Travel through the stunning Chianti countryside to San Gimignano, famous for its medieval architecture, surviving 13th century towers, hilltop setting and encircling walls. Enjoy time to climb the towers and relax in San Gimignano’s quaint Piazzas before continuing to Florence. On arrival, enjoy the afternoon at your leisure before regrouping for a magnificent dinner. Meet your local guide and enjoy a wonderful walking tour of Florence. Along the way, you’ll discover the Ponte Vecchio, the Duomo, the Giotto’s Campanile, the Baptistery with the Gates of Paradise and the Accademia Gallery, that houses Michelangelo’s masterpiece – the Statue of David – as well as his ‘Unfinished Prisoners’. Enjoy the afternoon as you please to perhaps visit the Uffizi Gallery, which hosts some of the most important works of Italian and Florentine artists. Alternatively, indulge in Florence’s fantastic shopping including its reputable leather goods, central market and world famous gelato boutiques. Enjoy the morning at leisure for last minute shopping or sightseeing possibilities. In the early afternoon, step aboard the fast train to Venice, an amazing UNESCO World Heritage Listed city, built on 118 islands with 150 canals and 400 bridges! Check into your wonderful hotel and enjoy the rest of the day at your leisure to explore the winding canals. Enjoy a morning guided tour of Venice including the Rialto Bridge, the Grand Canal, the Bridge of Sighs, St. Mark’s Basilica and entry into the Doge’s Palace to witness legendary paintings by Tintoretto, Veronese and Bosch. The afternoon and evening are at your leisure. Enjoy an iconic gondola ride, browse the city’s artistic glass, leather goods, antiques and jewellery stores or take an excursion the islands of Murano and Burano to marvel at the work of master craftsmen. Guests not continuing with us will be transferred to the airport for your ongoing journey.